Rick Oglesbee has been in the financial services industry since 1995 and has been with Merrill Lynch since 1998. Rick was born was in New Orleans, LA and spent time in Connecticut, Colorado, Pennsylvania and Florida growing up. 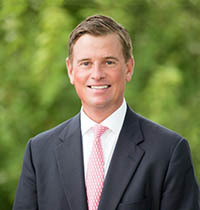 He is a graduate of Roanoke College with a BA in History and is still very active with the College being President of the Alumni Executive Council and is a Board of Trustee for Roanoke College. Rick is a member of Myers Park United Methodist Church. Rick and his wife Reagan, daughter Laine and son Lawson live in Charlotte, NC. In his spare time he enjoys travelling, deep sea fishing and snowboarding.